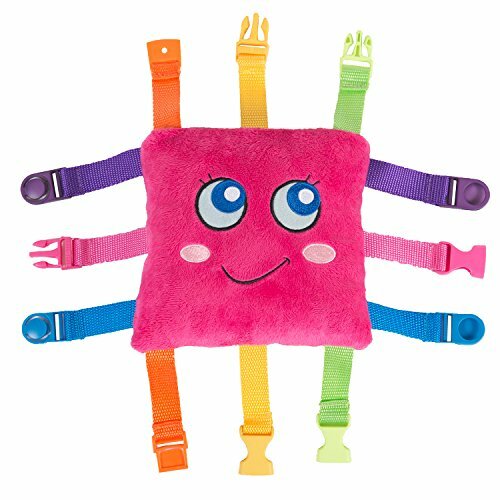 I'm Pink Bella Square- The Buckle Toy®. I'm loved by every girl and boy. My super soft plush is uniquely designed with colorful primary bold colors to appeal to any child's early fascination with buckles. Toddlers will not only learn to 'SNAP' and "CLICK' but also develop and strengthen fine motor skills, hand eye coordination, problem solving, and color recognition. My cuddly body is embroidered with cute animal faces that are hidden beneath flaps that each have a different color and number. Ask your child to find the dog and watch them smile as they lift each flap till they find it. I help kids learn and entertain them too. Whether it's counting to improve math skills, naming the pictures (ladybug, butterfly, owl, princess, mermaid), zipping up and down, or snapping buckles there is plenty for kids to learn while on the go. Can't fit me in your luggage bag, suit case or carry on? Strap me on your stroller, diaper bag, shopping cart, car seat, or high chair. My favorite places to play are in the car, train, airplane, and doctor waiting rooms. I'm also very popular for improving motor skills for special needs, autistic, and disabled children. I've been PROFESSIONALLY safety tested. And don't worry if I get dirty...I'm surface washable. I'm a great distraction for kids at the dentist; I'm better than a lollipop...and I don't cause cavities. I'm also lightweight and easy to hold for your little learners. Please oh please won't you order me. I'm the best buckle pal there could ever be. If you have any questions about this product by Buckle Toys, contact us by completing and submitting the form below. If you are looking for a specif part number, please include it with your message.